Being an international student on a summer Pre-sessional course in EAP (English for Academic Purposes) is a positive introduction to the academic life and culture at a UK university, and many former Pre-sessional students say how valuable it has been when they move on to their future courses. Courses may vary in length – at the University of Southampton they range from 16 weeks to 6 weeks, depending on students’ entry point (usually reflected in their IELTS grade). There may even be a pre-arrival online component to a Pre-sessional course. Most of the students who participate in Pre-sessional courses are required to do so in order to improve their academic English skills; however, some participants, who have already met their university’s entrance requirements, may choose to do a Pre-sessional course to improve their readiness for their future studies. Each university will have a website outlining their Pre-sessional provision for their own international students. Pre-sessional courses provide an opportunity for students to work intensively on all their linguistic skills within an academic framework and their university environment. While IELTS is generally the recognised exam taken by most students when applying for entrance to their chosen subject area, it does not prepare students for the demands of academic study. On a Pre-sessional course, students will practise researching, preparing and writing long essays, and using academic sources to support their arguments. They may be required to practise giving presentations based on aspects of their research too. Reading journal articles, attending lectures and participating in seminar discussions are also key components of most university courses so a Pre-sessional course is a very useful ‘dry run’ for the real thing! Students’ progress and achievements are made clear both during and at the end of a Pre-sessional course, and tutors will always want to ensure that students are moving on to their future courses with the skills they need to do well. This means that ‘yes, the learning curve is steep’ and a significant amount of student work is produced during the course, but by the end, students will feel that the rewards and sense of achievement are definitely worth it. Pre-sessional courses are also a great way to meet and make new friends and are, hopefully, a time to experience some of the best British summer weather! It’s a busy time and an opportunity to really focus on getting ready for your future studies. What is studying in the UK like for Chinese students? In the past 4 years of study, I have been through many ups and downs. Thanks to a high IELTS score, I did not have to do a pre-sessional preparation course; however, I felt that I was disadvantaged as I missed all the lessons on academic expectations and skills required in an English-speaking environment. Consequently, the first semester was the most challenging, when I had to manage different academic expectations while I was adjusting to a completely different physical environment. Coming to study in the UK was considered a short-cut after I completed 3 years’ diploma in China. The idea was to spend 1 year on a final year of my undergraduate (UG) degree, and 1 year on my postgraduate (PG) degree. That is to say, within 2 years, I would be able to graduate with a Master’s degree, which would normally need 5 years if I chose to study in China. As a matter of fact, I ended up with the award of PhD after spending 4 years in the UK (1 year on UG and 3 years on a PhD). The first day coming to the university was very memorable. I was surprised to see so many international students from so many different countries, with different accents and limited English. The first week was International Orientation Week, particularly organised for international students, and home students only came a week later for Induction Week. Nonetheless, l had fun during that week and I participated in various social activities, met many friends from different parts of the world and built my confidence speaking English with other international students. After the course started, I was surprised that a textbook wasn’t given to us, only a few ‘Module Guides’ which contained only brief information about the course, the assessments, and a long reading list. There were no course textbooks like in China, and I was expected to read widely from books I found for myself, and also journal articles, news items and other database information as recommended in the reading list. The reading was just killing me at the beginning! I was not used to reading full English texts without any Chinese explanation / translation so it often took me ages to finish reading a recommended chapter or an article. Gradually, I learnt to read for ‘gist’ – skim and scan for information – instead of reading every single word, and I also kept a good dictionary with me. 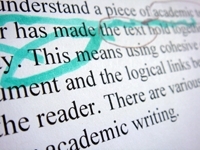 Gradually, my improved reading helped with my writing, although the paraphrasing techniques I had to use in writing, as well as referencing, were other difficult things for me initially. When I used to study in China, I didn’t need to include any references in writing, or acknowledge sources, because we regarded citing others’ work as an honour for them, and we regarded things written by them as available for others to know and to use. However, I learnt that in the English academic world, referencing is a serious matter and if it is not followed properly, students can be accused of ‘plagiarism’ which is a serious academic misconduct issue and has serious consequences. Therefore, referencing is definitely something I had to quickly learn in the UK. In her next guest blog post, Xiangping discusses more of the challenges she met whilst studying in the UK, especially in academic assignments and critical thinking. Xiangping has co-written Study Skills for Chinese Students with Michael Courtney, who is also an Academic Skills Tutor at the University of Hertfordshire. They have taught Chinese students in China and the West for many years, and using her own experience both as a student and as a Tutor, Xiangping shares strategies for effective study. Chinese students interested in purchasing the book via the Sage website can receive a 25% discount using this code: UK15SM04 (enter it in the promotions code box during the checkout process). This offer is valid until the 20th March 2015. This week’s blogpost is in reply to a student who has asked where to find online materials in English for Academic Purposes (EAP) for self-study. Where can I find more activities to practise academic writing? How to improve my vocabulary? A new online resource that has recently become available for students is the PAL (Pay, Access and Learn) portal. This site allows individual learners to choose and then license sets of interactive online learning resources at low cost and for periods of either one month or three months. Each set of ten learning resources on a related topic provides at least six hours of activity-based online learning. Currently sets available include basic and more advanced skills in academic writing and vocabulary for study purposes. The website provides a complete list of available sets. Online renewal or licence extension is easy and can be done at any time from anywhere. These will be of interest to learners already studying EAP (English for Academic Purposes) or preparing to apply for university courses in the UK.